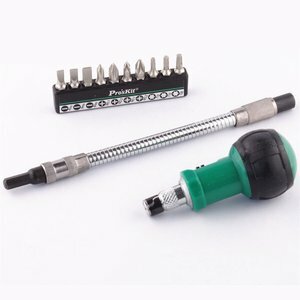 Pro'sKit 1PK-201 – a flexible ratchet screwdriver set. 190 mm (7.5") flexible shaft gets into hard to reach area. Screwdriver with various bits: T10, T15, T20, PH1, PH2, SL5.0, SL6.0, SL4.0.